A recently-discovered asteroid approximately the size of a bus is set to whizz between the Earth and the moon on Thursday afternoon. Asteroid 2017 TD6 will safely pass by Earth a mere 119,000 miles away during its closest approach to the planet at around 2:53 p.m. EST. 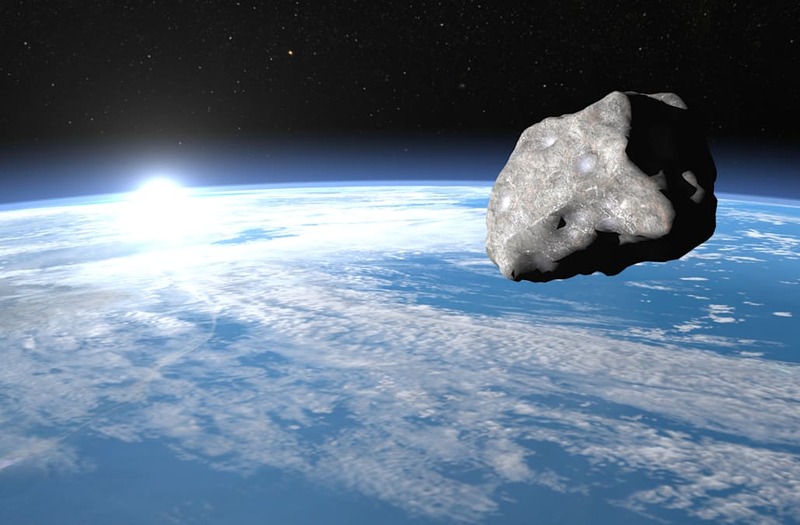 The large space rock, which is estimated to be between 32 and 72 feet wide, has been observed over the past few days by scientists around the world, who have concluded that the asteroid has no chance of hitting the planet. This rather close approach comes on the heels of asteroid 2012 TC4, which shaved by Earth at a distance of 26,000 miles away on October 12. Photographs can show us things that unaided human eyes cannot see. Mount a camera on a tripod, point it at the heavens, and open the shutter, and you can capture an image of curving streaks of starlight that reveal information about our planet and its position in the solar system. I have made such time exposures of space from Earth, so when I had the chance, I figured it was only fitting to make time exposures of Earth from space. Human eyes can only see a limited slice of the full electromagnetic spectrum. Just beyond what we see as deep red at one end of our “visible spectrum” is infrared radiation, wavelengths that are rich with information about our environment, but escape our detection.... In this infrared photograph, lush green plant life appears as bright orange-red. Rocky crags and other barren geologic structures appear as dark green to blue-grey. Turbulent oceanic currents become visible as whitish veils, and coral reefs glow a tie-dyed yellow-green. From above, lights accentuate the places where people want to live, and darkness marks places where we prefer not to be. Dark and light tell a story—the story not only of where we are now, but also of where we have been. What was once a meandering cattle trail is now a super highway illuminated with sodium vapor lights. An urban core shaped by a modern master plan appears as a matrix laid out in a perfect grid. Older cities have more organic, even chaotic shapes. Oil fields appear as a pattern of mottled white spots; and fishing vessels surrounded by dark ocean look like star clusters in the night sky, creating new constellations for the zodiac. Daytime views from space are joyful, offering a wonderful display of saturated color. We are accustomed to seeing intensely colored photographs from space, scenes that present themselves as saturated treats for the eyes. Such brilliant images are central to any orbital photo essay. But if you strip away the colors, leaving only tones of black and white, the eyes discover new pleasures. Deprived of color, the mind searches for other details where new perspectives come into focus. From space I have been able to capture wide-angle oblique views of natural structures on Earth that stretch across half a continent, and telephoto views that showcase fine details. Light is the heart of these photographs. Low-angle sunlight casts long shadows, and gives depth. Noontime sun creates sun glint, intense lighting that causes surface water to act like a mirror directly reflecting the sun’s rays into the lens. Sun glint reveals ocean surface patterns that are invisible under any other lighting condition. Auroras are diaphanous incandescent displays. Intense greens, reds, and blues move across your field of view like phosphorescent amoebas. The greens swirl below our orbit, and the reds flow by at our same altitude. We fly through an aurora, and for a moment it is as if we have suddenly been miniaturized, and inserted into a neon sign. Near the terminator, the line that separates day and night, noctilucent clouds gleam with the iridescence of an abalone shell.